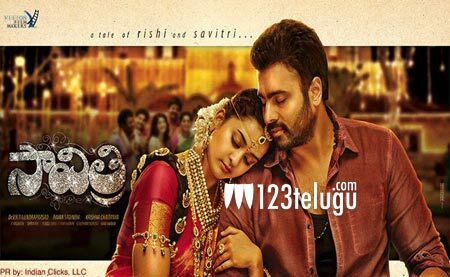 Savitri is a household name for telugu audience. Everyone relate to “Mahanati Savitri” and her family oriented performances. Here comes a complete family oriented Package with the same name “Savitri”. Nara Rohit, who has made a name for himself, with different story selection and experimentation is the protagonist. With a new look and a lot of ease, he is proving to be the next big name among the young heroes. Nandita ,who delivered a stellar performance, in “Prema Katha Chitram” looks very promising in the title role. Especially the “Aha Na Pelli Anta” part of the teasers will bring out memories of Mayabazaar. Pawan Sadineni, who impressed everyone with his debut through “Prema Ishq Kaadhal” is handling this wonderful project. He has a great choice for music and is repeating the hit combination of him and Shravan, who stole everyone’ hearts with Prema Ishq Kaadhal. How can one ever forget the title track in that film. The background music is fresh and the tunes are very catchy. The songs will surely get locked in repeat mode in everyone’s playlists. The teaser which set out the initial positive vibes has garnered great interest among moviegoers. We sincerely thank Pavan Sadineni for giving this opportunity to release ‘Savitri’ in Overseas.